What are the cheapest and most expensive countries to visit in the Caribbean Islands? The following travel cost rankings for countries in the Caribbean Islands are calculated based on the travel budgets of real travelers. 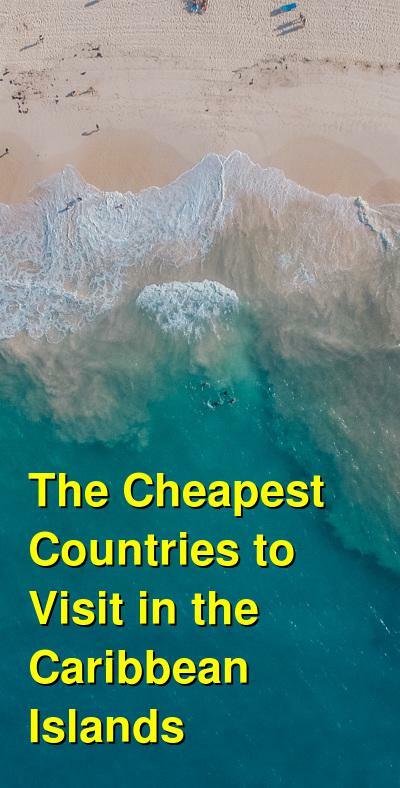 Also referred to as a Travel Cost Index, or a Backpacker Index, the countries below are in order from most to least expensive by their average daily travel price, per person, per day. What are the cheapest countries to visit in the Caribbean Islands? The least expensive countries for travel in the Caribbean Islands are currently Cuba ($17.43), Haiti ($44.67), Jamaica ($118.78), Dominican Republic ($122.89), and Bahamas ($123.67). What are the most expensive countries to visit in the Caribbean Islands? The most expensive countries for travel in the Caribbean Islands are currently Barbados ($304.82), Antigua and Barbuda ($281.94), British Virgin Islands ($264.32), Turks and Caicos Islands ($262.21), and Cayman Islands ($259.62). The Caribbean is a top luxury vacation spot, especially during the cold winter months. The variety of direct flights to the Caribbean means that getting to the islands is an easy process. With so many Caribbean islands to choose from, there's something for every member of the family! Every Caribbean island is unique, with a variety of landscapes, cuisine, nightlife, vacation activities, languages and events. The Caribbean Carnival kicks off in early February, with beach parties, dance parades, endless food and tons of fun. The best Caribbean Carnival islands are Aruba, Trinidad & Tobago, Jamaica, US Virgin Islands, St. Martin and the Cayman Islands. Your Caribbean beach vacation is full of a variety of activities. The Caribbean islands are perfect for snorkeling trips, top diving spots, fishing charters, golf vacations and more. Barbados is great for cricket fans and golf vacations alike. Bermuda is great for scuba diving and relaxing, wellness holidays. The Caribbean is also a hotspot for tennis, horse riding, water sports and yacht vacations. Every island in the Caribbean offers pink sunsets, blue seas and picture-perfect weather. Romantic Vacations in the Caribbean is simply a match made in heaven. Caribbean island locals are famously hospitable. Indeed, smiling service is as much a Caribbean icon as the romantic beach sunsets. From St. Barthelemy to the British Virgin Islands, spa vacations in the Caribbean include in-house spa treatments and exclusive luxury spa resorts. St. Lucia is a serene island that's perfect for a relaxing getaway. Extremely popular with both North Americans and Europeans during the winter months, the Caribbean is filled with islands and destinations that range from cheap and basic to posh and exclusive. By far the busiest destination in the Caribbean is Cancun. While it is not an island, Greater Cancun consists of Playa del Carmen, the Riviera Maya area as well as Cozumel, so it's a huge cluster of resort areas all served by one busy airport. With cheap flights from almost everywhere and hotels starting at very low prices, Cancun is one of the cheapest Caribbean destination and a great choice for the Spring Break crowd as well. Varadero is relatively cheap and good value for the Caribbean. Quality in its beachfront resort hotels is fairly high. Punta Cana has some modestly priced hotels that include breakfast, but it's much better known as the best and cheapest place for luxury all-inclusive resorts at amazing rates. There are really good air plus hotel packages available that can keep prices down and offer fantastic value for the Caribbean. Puerto Plata includes several clusters of resort beaches along the northern shore of the Dominican Republic. The hotels here are among the cheapest in the Caribbean, and this area is also known for very affordable all-inclusive packages even though flights to the nearby airport have augmented. Montego Bay is a very well developed and touristy area along Jamaica's north shore, with plenty of large all-inclusive resorts of different prices and quality and Jamaica's busiest airport closeby. Visitors can be checked-in sooner here than if they went to Negril or Ocho Rios nearby, but hotels can also be more expensive for that privilege. Negril, a 90-minute ride from Montego Bay Airport, has a beautiful west-facing beach and an abundance of cheap 2-star and 3-star hotels, making it one of the Caribbean's best value destinations. Samana has a few posh and expensive resorts, but it also has a nice mix of more affordable simple hotels near the beach. Thanks to some surprisingly cheap flights from New York, Curacao can be of excellent value for some travelers. Curacao has excellent diving and some of the cheapest hotels in the southern part of the Caribbean. It also has a large and busy airport which helps keep airfares reasonable from North America and several main European cities. Saint Barthelemy is one of the most expensive Caribbean island, and it has only a handful of small hotels, because most guests rent villas and condos instead. In reality, there are a few cheaper hotels here, but in-season this is really a scene best suited for those who are not on a budget. Flights are also expensive because you have to change planes nearby just to reach Saint Barthelemy. Only a few miles off St. Martin, Anguilla is a small and beautiful island that is near the upper end of the price scale for all of the Caribbean. Flights are expensive, though you can get here by ferry from St. Martin, but hotels are all very expensive as well. A few of the resorts here and in St Martin are among the priciest in all of the Caribbean. The Bahamas along with the British Virgin Islands (Tortola) and the US Virgin Islands (St Thomas, St Croix) are also not recommended for budget travellers.